Chrom, Lucina, KOS-MOS, and Fiora. Bandai Namco announced four new characters playable in Project X Zone 2 during its Tokyo Game Show stage event. 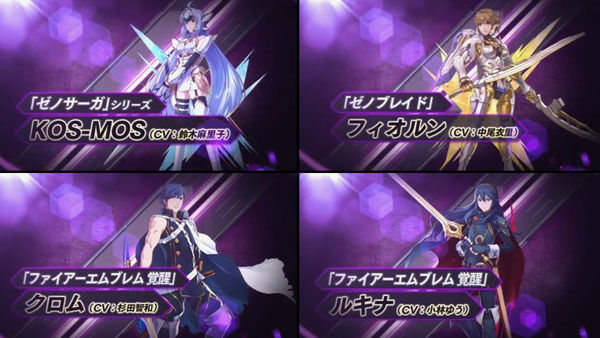 Fire Emblem: Awakening‘s Chrom (voiced by Tomokazu Sugita) and Lucina (voiced by Yu Kobayashi) make up the first new Pair Unit, while Xenosaga‘s KOS-MOS (voiced by Mariko Suzuki) and Xenoblade‘s Fiora (voiced by Eri Nakao) make up the second new Pair Unit. Project X Zone 2 is due out for 3DS in Japan on November 12, in North America on February 16, and in Europe on February 19. Bandai Namco plans to announce more new characters just before the game’s Japan release. Watch a trailer featuring the new characters below. View a new set of screenshots at the gallery.